Robbie Brown — Factory Design Worx INC. There are many retail stories being told, and included in the mainstream offerings are the specialty shops. Such is Robbie Brown, a menswear store catering to shorter men up to 5ive ei8ht. The Owner, no stranger to the clothing business, whose grandfather launched the original business in 1929, was ready to launch a new shop experience and selling philosophy, dispelling old preconceived notions of what a shorter man can wear. The design challenge, co-incidentally, was that the store footprint was compact. As the overall approach to the store’s color palette, rather than the “white is nice” for small spaces, we took a left turn, “don’t be afraid of the dark”, featuring all basebuilding surfaces, finishes in a deep grey, creating a dramatic, inclusive environment. A simple, tubular metal frame outrigger system, powdercoated in a claret color for pop, was developed to accommodate hanging requirements. Interspersed in the perimeters, were oversized, white armoires, to house specialty merchandise. 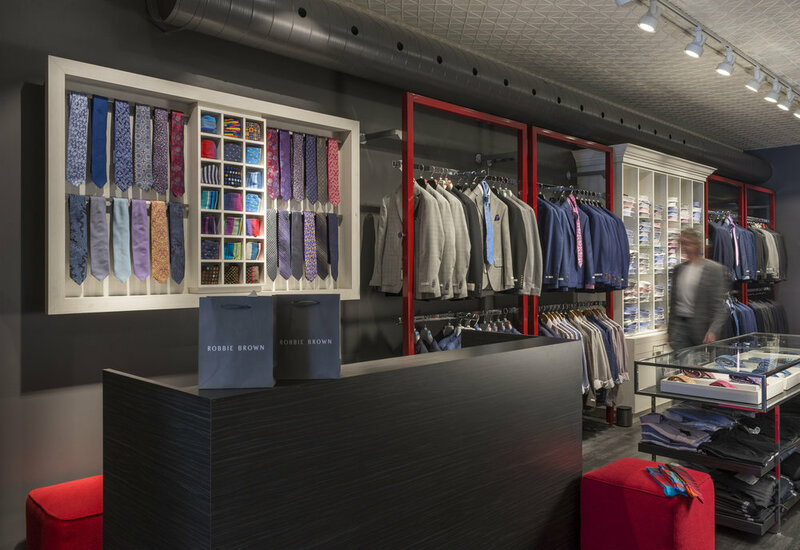 And although spatially challenged, we were able to accommodate a custom shirt showcase and large customer, consultation seating area, still leaving the customer with ample shopping freedom.